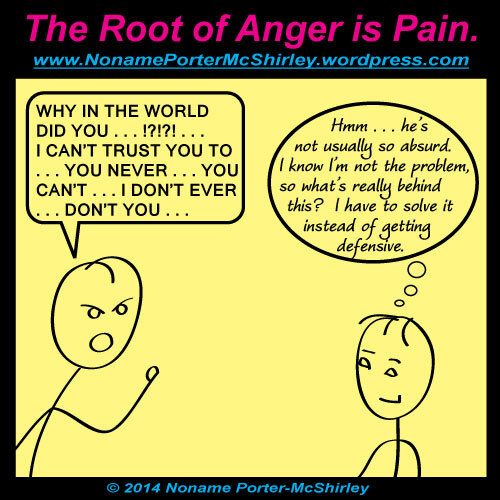 Pain Is the Root of Anger, and Why You Should Care. Understanding anger is the first step in dealing with your own, so that you can behave decently, and so that you are not controlled by automatic responses to other people. Understanding anger gives you helpful insight when dealing with angry friends or family members. Understanding anger is important in the bigger picture of society—for preventing the formation of, or responding to, masses of angry people. Think about what anger is: Anger is an emotion, a very intense feeling which summons your attention and energy; it is your subconscious talking to your consciousness while it rallies your body for what it expects your response will be. But if you have this detached perspective, then you are not bound to act as your feelings seem to tell you to act. But we are to be the masters of our bodies, not leave emotions in control. The first part, “Hey Master, notice this,” is rather automatic. The second part, the “Don’t you want to___,” is trainable. Untrained, we tend to be selfish and superficial. We grab what’s fun and strike back when hurt. But we can train ourselves to look beyond the surface before responding, and to be kind when hurt. What does it mean to be “kind when hurt”? Apologizing for existing because someone bumped into you, is not being kind. Being kind is taking note of your anger and telling it, “Okay, I got your message, now go back to work. I’ll handle this.” Then you look for more information about who hurt you and why, consider their point of view as best as you can see it, and offer some response which might actually help the other person to feel better—even if such a response has nothing at all to do with what they did to you. Person A has a problem which generates an angry feeling, and so lets those feelings explode on whomever is handy. Person B, feeling the pain of being unjustly blamed (exaggerated by feared future consequences), yells back about the injustice they feel. Person A, being far from calm enough to admit an error, gets even angrier from the pain of being accused of unjustly yelling. Person B, feeling the pain of being in a hopelessly negative situation, yells about how absurd person A is acting. Person A not only continues to defend his or her self, but also feels additionally pained/angry because Person B has not seemed to care about the original problem. When you realize that an angry person is actually a person who is in some sort of pain, you can shut off your retaliation instinct and proceed with empathy, love, patience, and possibly assistance. Acknowledge to yourself your own anger, but shut it down by working to alleviate or eliminate the underlying pain. And if that underlying pain is someone’s unjust anger vented on you, work to alleviate or eliminate THEIR underlying pain, and everyone’s anger will vanish.